Diarrhea in puppies is frustrating and frightening for a pet parent, especially because puppy diarrhea can lead to dangerous dehydration. In addition, canine diarrhea can also be a symptom of puppy worms. Weimaraners, generally known for their good health and pleasant personalities, are considered a very hardy breed that makes an excellent companion and hunting dog. Nonetheless, like any other puppy, Weimaraners can get sick. And diarrhea is often the first symptom you see in puppies who are ill. Because puppy diarrhea can lead to life threatening dehydration, your sick puppy needs attention. 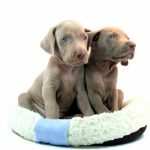 Unfortunately, Weimaraner puppies may not slow down or look sick when they first have diarrhea. It’s up to you to notice that your puppy is sick. When your Weimaraner puppy has diarrhea, you need to pay attention. Diarrhea can be life-threatening if your pup gets dehydrated. 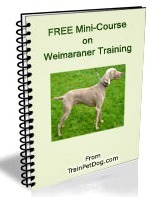 There are a variety of reasons that Weimaraner puppies get diarrhea. Keep in mind that, when your new little puppy has diarrhea, he is also likely to vomit. Just like with human babies, both diarrhea and vomiting can cause dehydration. Change in Diet – The most common cause for puppy diarrhea is a change in your puppy’s food, or feeding your pup substandard kibble. When you first bring your new puppy home, feed her the same food that she has been getting from the dog breeder. If you want to change to another brand, you should transition from one food to the other, gradually, over a week’s time. To make sure that the transition goes well and that your puppy doesn’t get diarrhea, give your dog some pumpkin dog treats as a preventative. Feeding your dog pumpkin is a healthy and natural way to get rid of simple diarrhea and firm up her stools. Change in Routine -Puppies also get diarrhea when they have a change in routine that causes them stress. 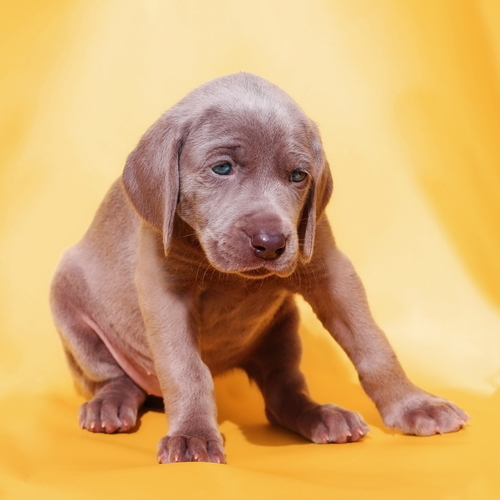 Your cute little Weimaraner puppy is emotional and she reacts to stress, just like you. When you first bring your new puppy home, move to a new home, or change her feeding schedule, she is stressed. Dogs like Weimaraners, that are more sensitive, can have digestive upsets. 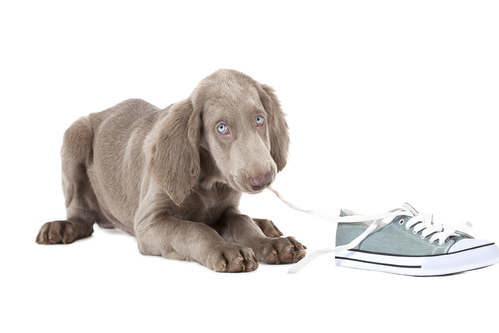 Eating Junk – When your Weimaraner puppy eats something she should not eat, she can get diarrhea. This can be something outdoors, moldy food, poop or something else that isn’t meant for consumption. Worms – Weimaraner puppies can get worms, just like any other dog. And, sometimes when you give them worm medicine, they can get diarrhea from the medicine. Of course, there could be more serious issues involved. If your dog continues to have diarrhea for more than two days, contact your vet and make an appointment. When you first notice that your puppy has diarrhea, the first thing you should do is reduce the amount of food you give him daily to 1/2 – 3/4 cup. Instead of kibble, you might give your puppy something bland like rice mixed with boiled chicken. Either white or brown rice is OK. Consider adding a teaspoon of cottage cheese or yogurt to the mix to help settle your puppy’s stomach. Foods with probiotics in them will help to re-balance the bacteria in your dog’s digestive system. And, given routinely, they also prevent future bouts of diarrhea. If you keep a product like Vetoquinol Pro-Pectalin on hand, give some of this supplement to your puppy at the first signs of diarrhea or if you know that your dog has eaten poop or some other nasty substance. Two dog treat supplements that will help reduce or get rid of diarrhea are Olewo Carrots Digestive Supplement and Diggin Firm Up Pumpkin Supplement. Both are made from natural foods that are known for normalizing bowel movements. Along with a bland diet, make sure that you provide your pup with plenty of water. This is very important – you want to keep him well-hydrated until his digestive system improves. If your pup seems disinterested in water, try adding some low fat chicken stock to his feeding dish. Also do your best to encourage your pup to stay relatively quiet. 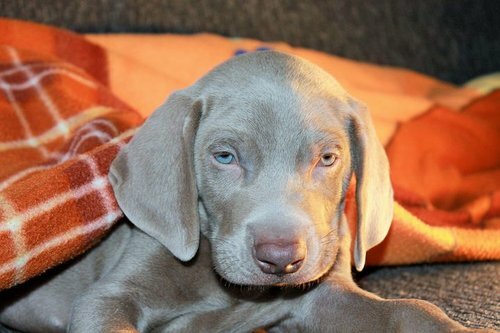 A Weimaraner’s energetic temperament may make that difficult, but it is best for your puppy to slow down and get some rest. If you keep some of the products mentioned above on hand, you’ll find that Weimaraner puppy care becomes easier. And you’ll go to the vet less often.